Are your online efforts getting traction? Start your metrics engines! Congratulations, you’ve jumped into the social media waters, and it feels pretty nice. Now what? Not all tools measure the same kinds of things, so you may find several of these useful for your efforts. In addition, some are useful for measuring your blog’s or website’s reach, while others assess your mojo on a particular social network. Our criteria? The tool must be useful, free (freemium versions are allowed) and we had to use it ourselves. 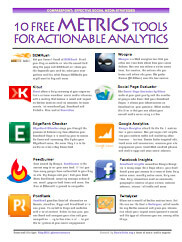 We’ve condensed the list below into a one-page printable handout: 10 Free Metrics Tools for Actionable Analytics. Here, then, are 14 free tools to measure your organization’s impact in social media and on the Web. Please add your own favorites in the comments! SEMRush: What does your site rank for? 1I’ll bet you a nickel you haven’t heard of SEMrush — and that you’ll find it valuable. Just plunk your blog or website url into the search field atop the page and SEMRush will show the keywords it ranks highest for. For example, I had no idea that my Socialbrite article 4 examples of corporate social responsibility done right is the No. 1 Google search result for “examples of corporate social responsibility” or that our article How to set up an SMS campaign system is the No. 2 Google search result for “sms campaign.” SEMRush will show you what you rank for, what your competitors rank for, what Google AdWords you might consider buying and the terms you should be focusing on in your blog posts. Woopra: How are your visitors behaving? 2We like what we’ve seen of Woopra, a Web analytics tool that provides real-time data about how users are interacting with your site. While the visitor moves through your site, you can see where she came from, her approximate location, the actions she performs and where she goes off to next. Woopra has a freemium model: While the free version of Woopra is severely limited, you may soon want to move up to the Bronze ($4.95 per month) or Silver edition ($14.95 per month), which let you segment your visitors (say, referrals from Facebook, Twitter or StumbleUpon), print out customized reports and track trends over time. Like SEMRush, Woopra helps you get your own house in order before moving on to your outposts on the social Web. 3Klout offers a daily summary of your organization’s or team members’ social media influence, with a ranking that factors in your reach and impact on Twitter (metrics such as retweets, follower counts, list memberships, unique mentions), Facebook and LinkedIn. Klout has an open API that’s integrated into many Twitter apps: More than 750 partners use Klout data, including Hootsuite, CoTweet and Attensity 360. For the end user, its analytics platform is rich and easy to use, even if the methodology used in spitting out a Klout Score is a bit opaque. See the full review of Klout. A detail from Socialbrite's Facebook Insights dashboard. 4Facebook beefed up its Insights service this year, to good effect. Now Facebook Insights resembles Google Analytics in many ways. As a Page admin, your dashboard gives you access to a trove of data: daily active users, monthly active users, daily new likes, daily interactions such as comments, geographic location of your visitors (broken down by country, city and language), external referrals, internal link traffic and more. When you have spikes of user engagement, Insights will show you caused them. It’ll show you what content most interests your readers, and it’ll let you and your team understand and analyze growth trends. One big limitation is that you can’t access a lot of the data older than a week. Bit.ly: Are your promotions working? 5Our favorite url shortener, bit.ly, provides double duty by offering analytics and click data for every link shortened. Click data lets you see how effective your social media promotions are. Just log into your account to see click-through numbers. A new feature, bundles, lets you group similar links together. Both the free version of bit.ly and Bit.ly Pro handle our metrics needs without the need to upgrade to Enterprise ($995 per month). TubeMogul: Who’s watching your videos? 6If you’re familiar with TubeMogul, you probably think of it simply as a way to upload your videos to multiple sites, saving you the hassle of uploading videos over and over. But TubeMogul has developed a rich set of metrics lately, letting you see stats on how many people have watched your videos across networks. Real-time analytics include views, viewed minutes, audience geography, embeds, referring sites and search terms and more, all via your dashboard. Cross-compare by category, content delivery network, advertising mix or video player. And it’s free. YouTube Insight: What parts of your video are ‘hot’?